MSNBC host Chris Matthews and guests Clarence Page and Jonathan Alter discuss words and phrases used recently by Republican politicians that they accuse of being racist. Matthews brought up Dinesh D'Souza's film "Obama's America" and Sarah Palin using the phrase "shuck and jive" in a recent Facebook post as examples of Republican racism. "A dog whistle is a dog whistle, Clarence, a trumpet call is another," Matthews said about Palin's "shuck and jive" comment. "Shuck and jive has a particular ethnic connection, not necessarily bad in all cases. It's slang, it doesn't mean evil. To throw it at the president is an ethnic shot, pretty blatant," Matthews added. Matthews says Tommy Thompson's son making a Kenya joke is racist. "I have nothing against Tommy Thompson's, but he's raising his kids wrong," Matthews said about the parenting of the Republican Senate candidate from Wisconsin. Bloomberg columnist Jonathan Alter called the comments are "rank racism" and "racist tropes." "I think this is rank racism. You know sometimes people on the right get very upset with people on the left charge racism. But shuck and jive, that's like talking about watermelon or, for Jews, talk about Jews are greedy, or the Irish are drunk, or whatever. These are racist tropes and we need to call them what they are," Alter said. "And I actually think, at least implicitly, Trump was playing on racism today with his ridiculous stunt demanding college transcripts. What's this subtext," Alter said, which changed the topic to focusing on how it's racist to talk about Obama's college records. "What is that about? It's about affirmative action, we know what it's about," Matthews said. "He's basically saying Barack Obama was too stupid to be at Columbia -- because he was an affirmative action student, and therefore -- because he was an affirmative action, he must not of had good enough grades to stay in college or whatever he's talking about. It's racist. Let's get serious about this," Alter said. Matthews, perhaps fearing no one is taking all these charges of racism seriously says they're not seeing things. 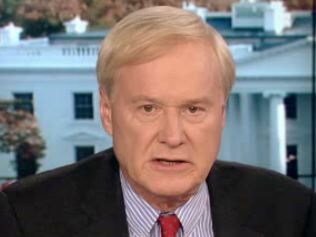 "Anybody out there, by there, who thinks we're seeing things, it's over and over again, and if you say we're seeing things you're dead wrong and you're dangerous because people who don't hear it, should hear it," Chris Matthews said on "Hardball." At the end of the segment, Chris Matthews makes a statement on behalf of all white people. "Let me tell you something as a white person. I think it's a statement against the white people to talk like this. It has nothing to do with blacks, it's a sickness by the people. Anyway, they ought to be ashamed of themselves. We should be beyond that," Matthews said. Clinton Says Benghazi Not Labeled A Terror Attack: "Something On Facebook Is Not In And Of Itself Evidence"
Obama: "No More Serious Issue On A Presidential Campaign Than Trust"